Comics Experience Blog: John Layman and Rob Guillory join the book club! John Layman and Rob Guillory join the book club! Sorry for my so lame lack of posts lately, but I kind of have to talk about this. 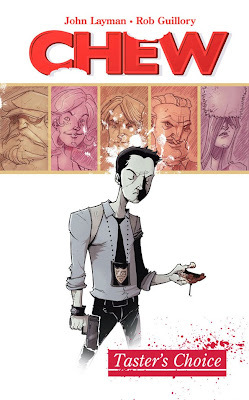 Hot off their Eisner win for best series, John Layman and Rob Guillory joined our book club last night to discuss their ongoing series called CHEW. Now this is no ordinary comic. It's about a cannibalistic detective... sort of. It's about a woman so gifted with her writing skills, that when she writes about food, the reader can actually taste what she's talking about. It's about aliens in space doing weird things. It's about a bird flu epidemic that made the FDA the most powerful government agency on Earth. And can you believe, no one wanted to publish it? Layman and Guillory have certainly proved their detractors wrong with the huge and home-grown success of CHEW. And it's because it's a project they believed in--even when no one else did. And that's a lot of what they talked to the Comics Experience Creators Workshop about in last night's book club meeting. Sure, we talked about all the clever stuff in the book, like how being vomited on was used as an ultimate declaration of love, but we also talked with John and Rob about how they got started, why they pursued this book in particular, and why, oh why, did John agree to join us when he was headed to New York the next day for signings (knowing all along he would be in big trouble with Mrs. Layman). These two creators managed to be both informative and inspirational with our workshop members and we're happy they came. If you're interested in the Workshop and book club (now combined into the workshop together for one price), check it out. 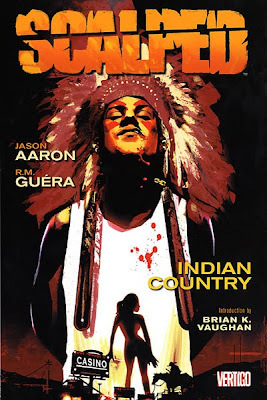 Our next guest speaker is going to be Jason Aaron and we'll be discussing his book SCALPED. And before that, we're going to discuss Ed Brubaker and Steve Epting's CAPTAIN AMERICA: THE WINTER SOLDIER, and SCOTT PILGRIM. If you love comics or are interested in creating them--or both, I hope you'll consider joining us soon. This is too good to pass up! And in case it wasn't clear, we all want to thank John and Rob for stopping by! John Romita Jr. Could critique your art!